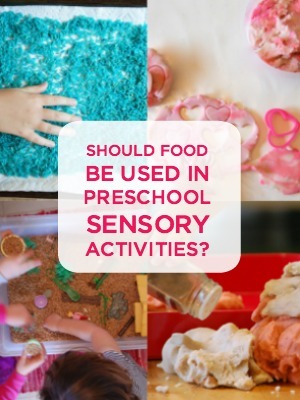 Ever since I dipped my toes into the world of Early Childhood Education, the hotly debated issue of whether or not food should be used in preschool sensory activities has come up multiple times. My background in the arts, where all supplies were fair game for art-making, didn’t prepare me for the variety of opinions that circle this topic. 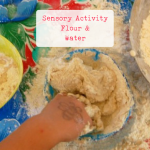 There are many good reasons to stay away from using food in art or sensory activities, and most of them apply to preschool classrooms and daycare centers where children of multiple backgrounds and food sensitivities will be affected. Maybe you’re like me and haven’t thought about this much until now. I encourage you to read through the thoughtful comments in this post and come to your own conclusion. 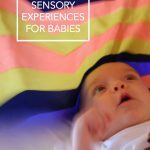 Since this question comes up a lot, I wanted to take a moment to unpack it here and share some of the pros and cons for using food in toddler and preschool sensory activities. Please keep in mind that the word “preschool” can relate to a preschool classroom setting or to the age of a preschool child who is at home. My own answer to this question (shared below) differs according to the context. I’d love to invite you to share your thoughts on the topic, as it’s quite possible that something will be left out. My goal isn’t to convince you to take a stand in one camp or the other, but to provide you with the tools you might need to make a decision that’s right for your situation. I pulled together some reader quotes from the aforementioned conversations and invited some blogging friends to chime in on the topic as well. 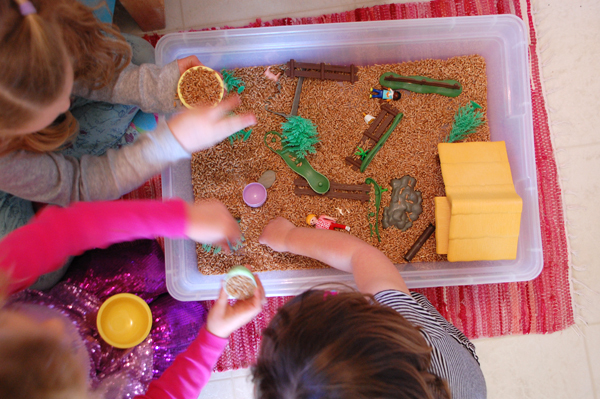 If we are not “pro-food” in sensory play, then what are we? Unless you’re only then reaching for natural materials, the alternative is synthetic, manufactured items that cause their own environmental footprint and sense of “disposable” waste. 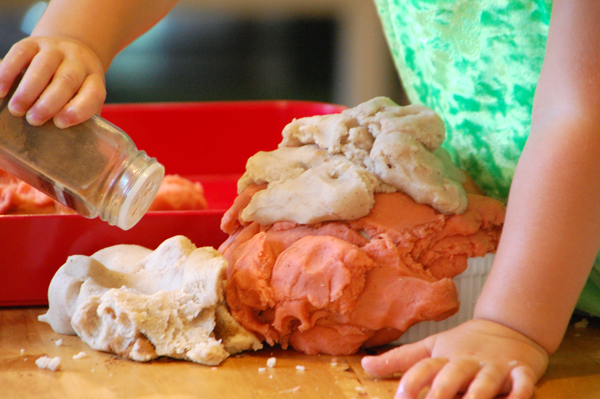 If properly cared for, food sensory items can be reused again and again — the same bag of quick oats, the same batch of homemade playdough. Food provides unparalleled, multi-sensory engagement and is something that most people reading will have ready access to. As I mentioned earlier, my background in the arts prepared me to think abstractly and broadly about what can be used as an art material. When I set up my first art studio, Chris Ofili’s paintings with elephant dung and Damien Hirst’s real shark floating in formaldehyde took the art world by storm, demonstrating just how far artists can push past the use of traditional art supplies. I happily made things with non-art materials like Valentine conversation hearts, resin (which comes from trees), and flowers collected from my garden. 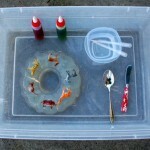 Wasn’t this better, and maybe more interesting, I thought, than spending tons of money on store-bought supplies? Now here’s an interesting fact about store-bought art supplies: Food and natural materials are often in the ingredients. This is something to think about if you have a child with food allergies. 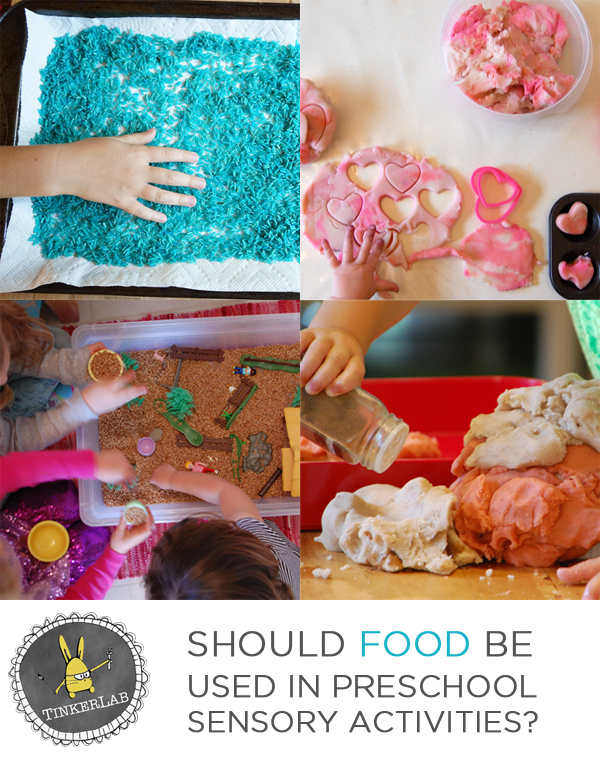 For example: Play-doh (flour, salt), Crayola Colored Pencils (soy), Air-dry Clay (corn starch), and Crayola Washable Markers (corn syrup). If we’re to avoid food products in art then we need to consider these less obvious culprits. These ingredients aren’t included in package labels and are essentially hidden from consumers. Since food products are found in store-bought art supplies, I see very little difference in adding food to my own supplies. 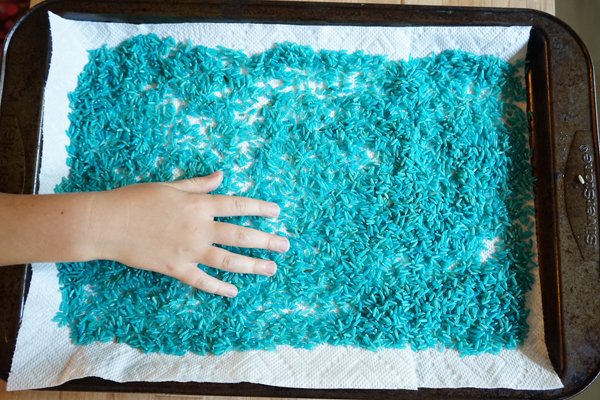 Introducing my kids to natural materials is also far more interesting to me that exposing them to toxic materials. 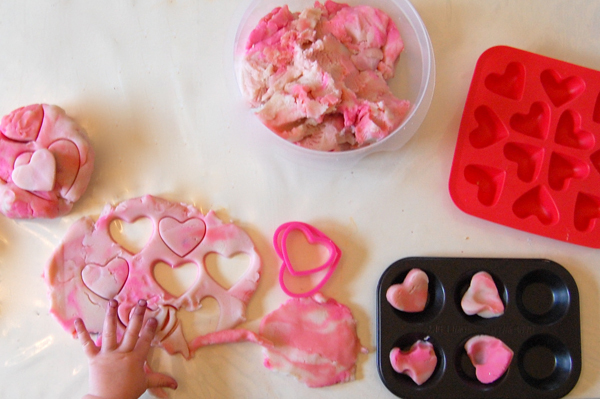 As such, we will occasionally use food for play or projects, and I’m more inclined to do so if it’s scraps, expired, or if the play/art supply will last for a long time. We do our best to recycle and return things to the earth. 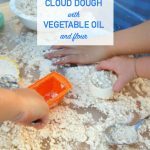 Some of the things we have used and made: flour and oil in cloud dough, rice flour in gluten-free cloud dough, rice in colored rice, flour in the best play dough recipe, wheat berries in our wheat berry sensory table, and sweetened condensed milk in milk paint. Food for Play in schools: I don’t run a school, but in that context there’s a good chance that I would avoid using food for play due to allergies and a desire to respect the religious and personal perspectives of a diverse audience. When it comes to the school environment, I often look to my colleague, Deborah, at Teach Preschool. See the first article, below. 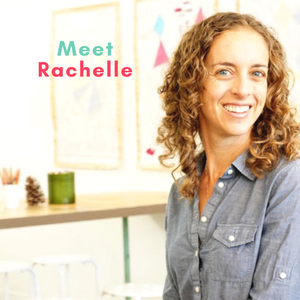 What an amazing and though-provoking post, Rachelle! Thank you for including our thoughts on food here. I have learned a great deal about other perspectives through this post alone. Wonderful and insightful! Thank you, Tricia! Gathering all of these perspectives together in one place has been hugely informative to me too. I’m constantly humbled by how little I know. This is a great article Rachelle and such a hot button with a wide range of perspectives and opinions. I don’t think one can stand firmly on either end of the spectrum and get it completely right but it is very good to be informed so that one understands the choices made by others and is more thoughtful in their own decision-making. In the end, I believe that when it comes to early learning, the best form of research – enlightenment – creativity – engagement – knowledge – compassion – and meaningful understanding about the child’s world and the things in the child’s world – is through play. Thanks, Deborah! I’m so happy to have your reasonable voice in this conversation. The more I think about it, the harder it is to take a firm stand. As parents, we can take a position for our own children, but educators have to think much more broadly about the bigger picture and the various positions of the families in their care. Thank you, Rachelle, for such a thoughtful, and varied, response to my question. 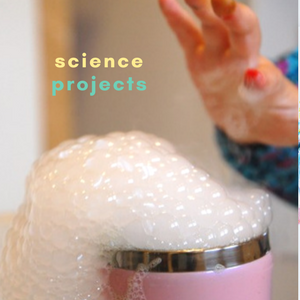 I was especially intrigued by the mention of the way water is used in the classroom and how scarce it is in some countries- and frankly- in our own USA- right now. I’m so glad I found you, bought your book, and continue to follow your insightful postings. Do you do any PD for teachers in the SF Bay area? If so I would love to explore it with you for my teachers. You’re welcome, Pam, and thank you for planting the idea in my mind! It’s been a while since I’ve done PD, but I would definitely consider it. I love working with teachers!! 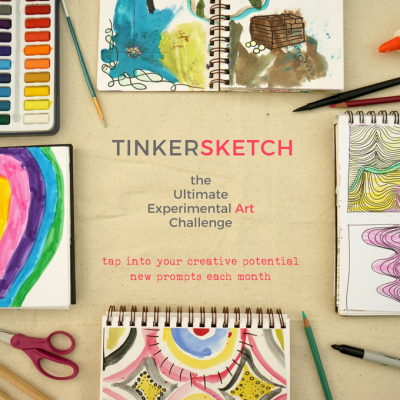 You can reach me at Rachelle at TinkerLab dot com. It is nice to see this being discussed and to see the different perspectives. As a parent of two kids with serious food allergies we had a very hard time. I would have loved to find preschools and elementary schools as thoughtful as these for my children. There were too many days where my child was sent to the front office because the rest of the class was doing a food play activity, other days where my little one had a serious reaction because the teacher “forgot”, and some days where I kept them home from preschool for the day because I was sick with worry after hearing about the planned activity. One of my children was so sensitive that if another child touched her with gluten-y fingers she got a rash. 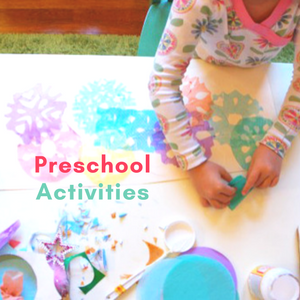 She missed out on many fun preschool experiences because of this and it broke my heart. I sat in during snack time at my little one’s preschool the other day, and was so impressed with how diligent the teacher was about keeping gluten away from the table (one child had an intolerance) with very little commotion. Aside from the philosophical debate around food being used for play in schools, there’s a very real issue with children who have allergies. Bravo to the teachers who take this seriously, and hopefully this post will raise awareness amongst those who haven’t come across this issue yet in their professional experience. 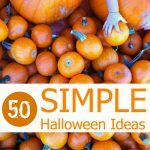 My son had food allergies once so I totally understand how challenging this must be! 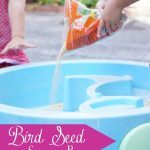 I am a firm believer in using natural materials in my sensory table/bins. I would much rather have something that came from nature than something made with chemicals. We store our materials and reuse them when possible. Or we repurpose them. We tried oatmeal this year, and when we emptied the table, my coworker and I took the leftovers home to feed to our chickens. I feel using these types of resources is more environmentally friendly than purchasing man made materials. I noticed something in many of these posts which seems to have a common theme though…. What a complicated topic!!! I certainly think that this is one of those topics where you just can’t please everyone all of the time. 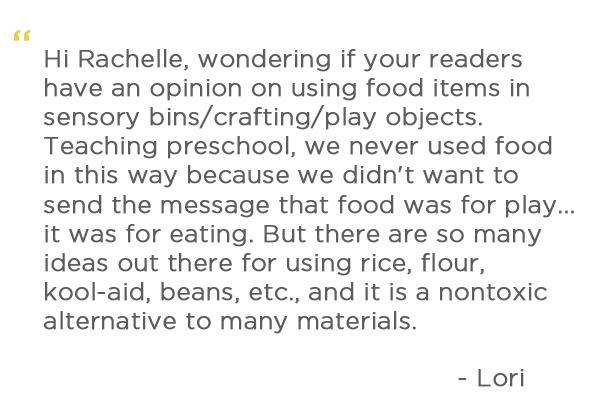 Like you, Rachelle, I was educated in a world where anything was used in the creation of art, and until recently, I never considered this to be an issue. And after reading through your well thought out post, I still find that for me, there will always be more pros than cons. And the idea that we are questioning whether or not to use food, but not questioning how we use water is likely to stick with me for a long time to come. I had one further thought as well though – if I were to opt for store bought (supposedly non-food) play items, and pay a premium for those items, then I have less money to donate to causes that actually get food to people who are hungry. If, however, I opt to use food for play items, at what is usually a much lower price point, I have more money to use in donations to help where it is needed. I love how you were able to incorporate so many opinions and perspectives under your headings. Thanks for including me! I really appreciate that you have put together this page. 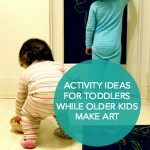 It is something that I have often deliberated over for my own workshops and home projects with children, but rarely expressed. I’m glad that you have opened up the discussion for those who are working in this field or with their own children at home yet may not given it a second thought, and it is incredibly helpful to hear so many different thoughtful viewpoints on the topic. Thank you for the work you did piecing together this discussion and presenting it to the public. My own thoughts are that it’s uncomfortably close to making a child clear their plate and not waste food. There are far more urgent issues around world hunger than a group of preschoolers playing with a 45p bag of rice. 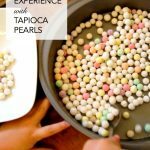 Allergies are always a consideration, but I don’t think we should stop all food play because of a child’s particular allergy – far better to work around the allergy. After all, we don’t ban bread due a child’s coelic disease, we work around it. Thanks for your thoughtful comment, Julie. Thanks for your comment, Georgia. I really enjoyed pulling it together and love hearing that it’s useful to families and educators.